An effective learning process almost always begins with comprehensively yet succinctly naming the challenge at hand, the president of the Indianapolis Center for Congregations says in this interview about his new book. Congregations don’t just do something new. They must learn to do something new. The Center for Congregations is a nonprofit funded by Lilly Endowment Inc. whose mission is to help Indiana congregations find and use resources and to share what it is learning with a national audience. As part of that work, the Center in 2015 revised and relaunched the Congregational Resource Guide (CRG). Shapiro spoke to Faith & Leadership about his new book, which includes stories about congregations of many types as well as reflection questions designed to help lay and ordained leaders learn how to do something new. The following is an edited transcript. Q: What do you mean when you say that congregations learn? For a congregation to achieve or accomplish something new, it’s not just a matter of doing something. It’s almost always a matter of learning to do something new. There are many things that happen in a faith community in which something new doesn’t have to be learned. If it’s summertime and the air conditioners need new filters, chances are somebody has done that before. You just have the volunteer do it or call the air conditioning company. The congregation has achieved an objective, as simple as it might be, but they haven’t had to learn to do something new. If it’s a matter of consequence, congregations don’t just do new things. They learn to do new things -- learning that is a durable change of behavior or attitudes or ways of thinking. For instance, imagine a congregation is seeking to start a new Wednesday evening program. This new program is designed not only for the elementary school children in their congregation but the elementary school children who go to the school two blocks away. It’s the first time the church has reached out to that school. So the congregation is going to need to learn durable new ways of behaving, thinking and feeling about such an endeavor. Q: What did you notice about congregations that led you to write this book? Congregations that were able to effectively do what they set out to do were essentially doing the same things. There was a pattern that became apparent, whether the congregation was effectively meeting financial goals around a capital campaign or whether the congregation was starting a new youth ministry or going on a mission trip for the first time. When congregations told stories about their achievements, the same elements were showing up regardless of the size of the congregation, regardless of the location of the congregation, even regardless of the congregation’s affiliation. This book is about the patterns I observed. For example, congregations that effectively developed new programs went on a learning journey, whether they were conscious of it or not. The learning journey includes defining your challenge, exploration of the issue, disappointment, discovery, taking on and letting go, validation, and then inevitably, another challenge. My hope is that if congregational leaders get to know some of these learning dynamics -- many of which are already occurring, just not at a conscious level -- they will become more intentional about the various conditions and factors that go into a congregation learning to do something new. The result would be less wear and tear on a congregation when it takes risks regarding new initiatives. Q: What would be an example of a helpful learning dynamic? Congregations often had to explore the challenge for a good period of time before they were able to implement the idea. There was a period of slowing down between identifying the challenge and receiving an epiphany about how to move ahead. There was a period of exploring the landscape of possibilities. This not only included slowing down and discerning in God’s time, but it also almost always included the engagement of an outside resource -- a helper, a support network -- to gain more education about the subject. Knowing that things naturally slow down as part of a learning process can help congregational leaders become less frustrated. Q: Are all congregations naturally learning communities? Almost all -- I would be hesitant to say “all” about almost anything -- are learning communities. Some of it goes back to the very nature of congregations. After all, the word “rabbi” means “teacher.” Congregations, like most human communities, need to learn how to do new things, just as a family learns new things when an infant enters that system, and corporations that are trying to earn profits have to learn new things to keep up with the markets. Most of us in community find ourselves facing challenges that are just beyond our grasp, our capacities. The book isn’t proposing a new theory. What it is doing is unpacking the positive dynamics that are already present in congregations that effectively learn to do new things. Q: Talk about the positive dynamics you’ve seen in congregations that do new things well. There are three different ways to categorize the dynamics that are going on, creating a sort of three-dimensional picture. Becoming a bit more conscious of these dynamics that are probably already present creates the opportunity for the congregational leader to have more agency over the process. First, there is a dynamic around congregational capacity. What is the congregation’s capacity in relationship to the specific program or initiative that is being considered? By capacity I mean the congregation’s ability, the strengths it brings to the new endeavor. If a congregation has never started a homeless ministry and that is its new challenge, then the congregational leaders are likely to need information and training before they can shape a program that works in their context. Mention promo code 4ALBWK617 when you order “How Your Congregation Learns” on the Rowman & Littlefield website or order by phone at 800-462-6420. Offer expires July 31, 2017. Discount cannot be combined with other special offers. I like to think about the capacity in terms of what level of learning is needed in a congregation in relationship to a specific issue. A congregation might simply need information. Or it might benefit from training, which is more sophisticated than receiving information. Some congregations have enough capacity to address issues through the lens of education and ultimately transformation, meaning that addressing this challenge will ultimately change something in the very form, culture, mission or worldview of the congregation itself. Every congregation has multiple capacities, so the capacity should always be evaluated in terms of the specific initiative. For instance, a congregation may have high capacity when it comes to rich, deep, beautiful worship, and indeed, something about worship is continually transforming the congregation. But perhaps when it comes to older adult ministry that might be new to this congregation, this religious community may have low capacity. There’s nothing right or wrong; just knowing that can help a congregation know the pace it needs to go and the resources that are most helpful. If you discern you have low capacity regarding a challenge, don’t jump in and hire a consultant or a coach. You will lose agency. You will give up your initiative to the consultant or coach. If your team is starting something brand-new with little knowledge, start by discussing a book chapter or a blog. Q: What else do congregations do well as they try something new? The second dimension has to do with the journey a congregation takes when it is learning to do a new thing. The journey includes the elements I mentioned earlier: defining the challenge, exploration, disappointment and so forth. If the first dimension is about capacity, this second dimension is a learning journey. It is the passageway the learning takes. Say a congregation is trying to initiate a new adult ministry, for both its members and the larger community. One of the things that happens in a congregation that effectively pulls off a ministry like this is they clearly define the challenge. Then they go on an exploration, like a survey of the landscape. This often involves engaging an outside resource -- a book, talking to another congregation. Often along the way, the congregation will experience disappointment. They may find out, for instance, that they don’t have enough volunteers to do the initiative like they want to do it. They might find that they had hoped to partner with some nursing facilities but they haven’t been able to find the right one. Even in the most successful congregational achievement, there is the presence of disappointment. But there is a moment of discovery -- a revelation, an epiphany -- that helps solidify the idea and make apparent the way in which implementation should go. When it comes to implementation, there is both a taking on and almost always a letting go of something else in a congregation. So this congregation pursuing the older adult ministry may find they are going to reduce the number of Advent activities for one season while they ramp up the older adult programming. Along this journey, there are experiences of affirmation that this is the right thing to do. Some of these moments of validation happen naturally, like receiving a thank-you note. Or some of it is planned, like a celebration. And then inevitably, there is always going to be a next challenge. This is the journey congregations go on, whether they are aware of it or not. It shows up in so many narratives, with almost every imaginable issue. All of these things are happening, because congregations are learning how to define their questions, explore, bear disappointment, let go, and validate what they are learning. Q: What is the final dynamic you observed? 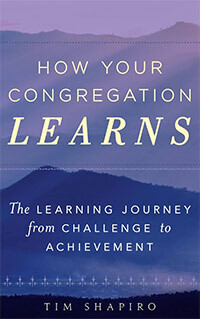 The third dynamic involves the behaviors that move a congregation along in the learning journey. Some of the behaviors include getting the timing right -- moving slowly at the right time, and then, once the way clears, being prepared to move more quickly. Another behavior has to do with the relationship between clergy and laity. The more there is mutual learning between the clergy and laity, the odds are the more effective the outcome is going to be. The energy in the mutual learning builds mutual affection. Or maybe it is the other way around. The apostle Paul identifies this in Romans 12:10: “Love one another with mutual affection.” This is very powerful, not unlike the way a high school student may fall in love with chemistry because he or she has a fantastic teacher, and there is a strong relationship between the student and the teacher. So there are certain behaviors that enhance a congregation’s ability to do new things. The behaviors include getting the timing right, strengthening the quality of relationships, attending to rites of passage and theological clarity, and using an outside resource that extends the congregation’s capacity in relationship to the challenge. Q: Do you think today’s world puts a particular demand on a congregation understanding itself as a learning community? I don’t know if contemporary life puts more demand on a congregation compared with another era, but I think the particular demands of today do make it necessary for a congregation to be a place of learning regarding life practice, religious life and organizational life. The primary factor in the decline of a congregation that is occurring in some, but not all, settings is best viewed through the frame of capacity in relationship to demands, not other various sociological reasons. In other words, there is nothing inherently wrong with your congregation. The current demands are an opportunity for learning. Q: What is one thing that congregations typically don’t do well when taking on a new project? Congregations that are effective in a new initiative are very careful and clear about what they are trying to do. Their description of a challenge simplifies the complex. When a congregation is not as effective, you can almost always see that the description is too nebulous or too general. Q: What other resources do you recommend for congregations beginning something new? One resource that is really helpful is a book called “Projects That Matter,” by Kathleen Cahalan. The book is clear, helpful and full of well-thought-out ideas. It helps a congregation think more strategically about evaluating results and impact. This interview was produced in partnership with the Congregational Resource Guide (CRG).